Oh wow did I just have an awesome treat! 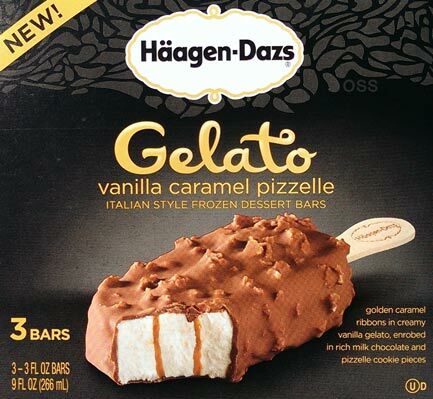 Haagen-Dazs just announced three new gelato bars two weeks ago, (tiramisu, strawberry, and the one below) and I was a afraid that this might be a gimmick to battle Talenti (& Magnum), but all my fears are gone now. This was love at first bite. HAHAHAHA, that's one fancy wrapper! 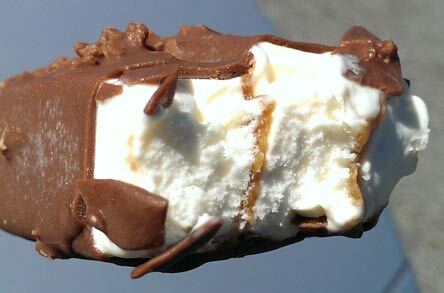 The wonderful aroma of quality milk chocolate hit my nose just before I dove in for the first bite and it was perfect. The chocolate is the right flavor and the right thickness to compliment all the other ingredients. There is such a well thought out balance here. I knew this would be a quality product, but the way it comes together is exceptional. Unlike the foolish hard cocoa nibs in the 2014 Magnum treats, these pizzelle pieces are perfect. Don't let their size fool you. They crunch effortlessly and you savor each and every bite you take. Their wonderful sugary sweetness is perfectly amplified by the wonderful caramel swirl inside. I can't stress enough how perfect each bite has been for me. 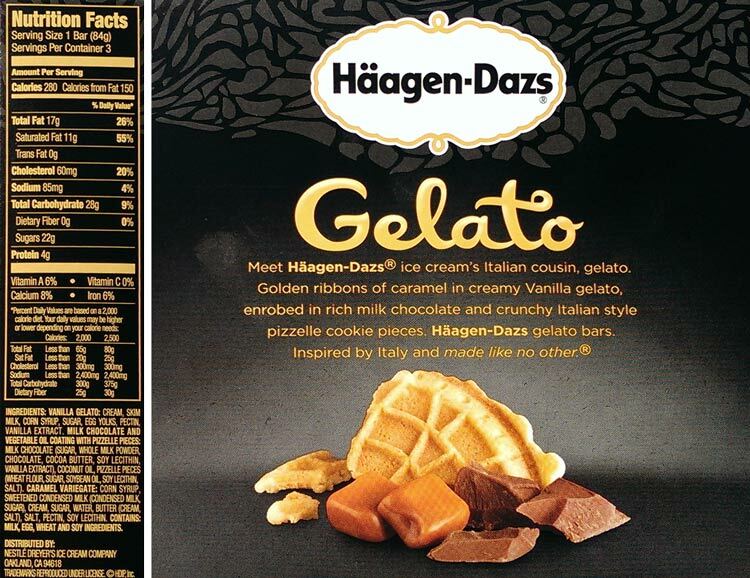 I know I eat quick, but every bite seemed loaded with chocolate, caramel, pizzelle, and gelato. I'm using all of my self control right now to NOT have another one. I'm just dumbfounded how good this bar was. If you see these, please buy them immediately. Sharing is encouraged but not required. On Second Scoop: Did I over hype this one? Taking one bite, I think "nope, this one is awesome". Give it a try and let me know what you think. My birthday is coming up (October 22) and I want to get a cake but I am torn! I want to get a Coldstone cake but I don't want to limit my options. You see, Publix has REALLY good cakes too. I don't have a Carvel near by (92 miles is the closest). This is a catastrophe. We do have a Baskin Robins, but I'm not sure. Along with not knowing where I want my cake, I don't know what flavor to get! Oh my... this looks so good! I HAVE to get some. Grocery shopping is on Thursdays though so... GAH. The wait is killing me and that's assuming I can actually find them! Target got them first somehow! There are three bars total but they only had this one. Didn't pick up a box (wishing I would have now), but I saw these at my WalMart neighborhood market. They had 2 other flavors, don't remember what they were though. I finally got my hands on some! Thank you both for your answers. Didn't even occur to me to try Target and sure enough when I got to the freezer section I found them fast.